For a city that’s just two hours or so from our home base, Olean, New York is not a place we get to very often, for whatever reason. We tried to rectify that on a free day in late April, 2014, when we pointed our way south and west under gray upstate skies for some station visits in this community near the Pennsylvania state line. 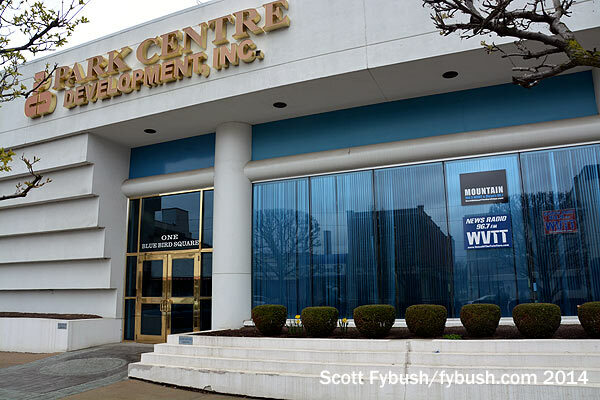 Heading south into town from I-86 (the former New York 17, the main east-west artery through the region), the drive down North Union Street brings us past the storefront studios of WMXO (101.5) and WOEN (1360). 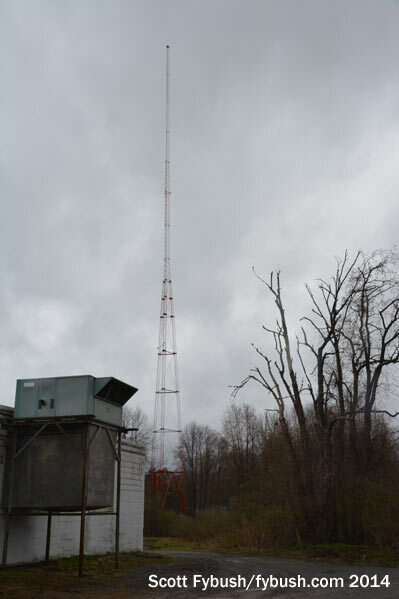 These stations were in the midst of some changes when we passed through, en route from Pembrook Pines’ bankruptcy into the hands of Sound Communications, which paired them (and WGGO/WQRS in nearby Salamanca) with its cluster in Corning/Elmira, an hour to the east. 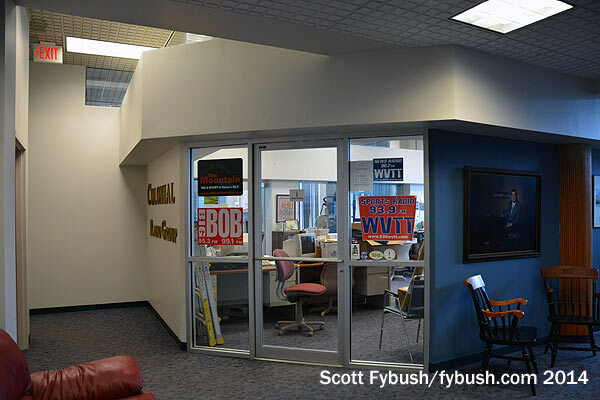 We didn’t get in there, but we did have a lunch date just down Union Street at Blue Bird Square, the office complex in the middle of downtown Olean that’s home to the headquarters of the Blue Bird bus company – and, in a prime first-floor corner spot, to Jeff Andrulonis’ Colonial Media & Entertainment stations. Jeff has put together an interesting cluster of signals here, making heavy use of HD Radio and translators. 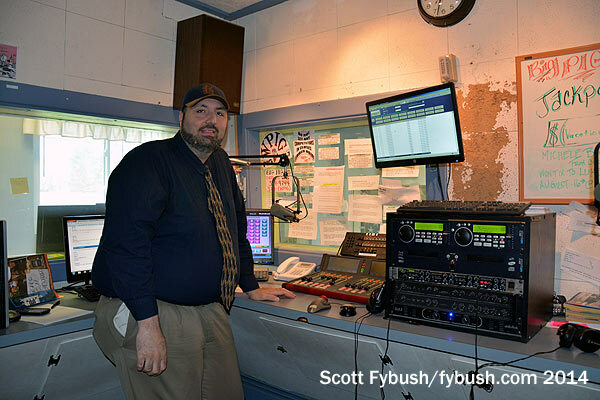 He’s got three full-power signals: WVTT (96.7 Portville) has the best Olean coverage, carrying a talk format and three HD subchannels. 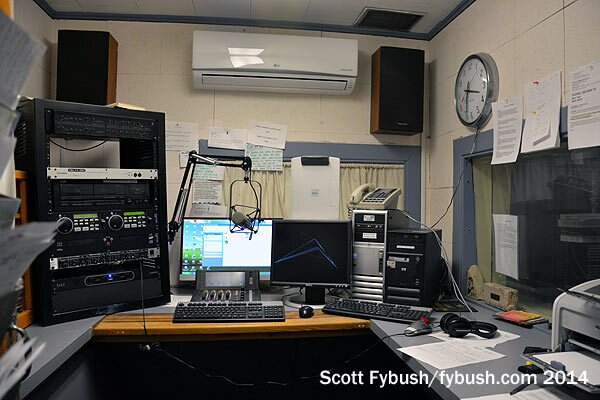 WBYB (103.9 Eldred) moved into the Olean market from Kane, Pennsylvania to carry “Bob Country,” and WXMT (106.3 Smethport PA) does rock as “The Mountain.” Three Olean translators repeat various formats from WVTT’s HD subchannels; they’ve changed around a bit recently, and the current lineup has a “Bob” simulcast on 93.9, a “Mountain” simulcast on 98.7 and “Eagle Country” on 99.1. Subchannels on the WXMT signal in northern Pennsylvania also feed a top-40 “Hot” format to translators on 95.3 in Smethport and 99.3 in Bradford, where Andrulonis also owns the Bradford Speedway. 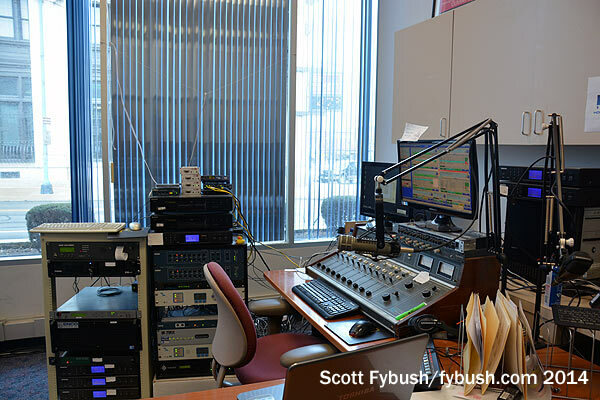 All those signals come from just a couple of studios arranged along the outside wall of the Colonial office, where ops manager Mat McCoy and the crew keep busy tracking local breaks on the music stations and news on WVTT. If you know Olean for anything at all outside the area, it’s likely for St. Bonaventure University, which is actually located just outside the city to the west on Route 417, the old route of 17 before the Southern Tier Expressway bypassed the city up to the north. 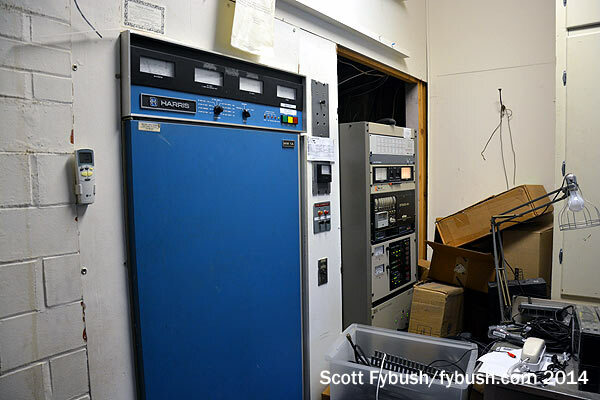 We didn’t get a chance to stop in at St. Bonaventure to see its station, WSBU (88.3, actually licensed to “St. 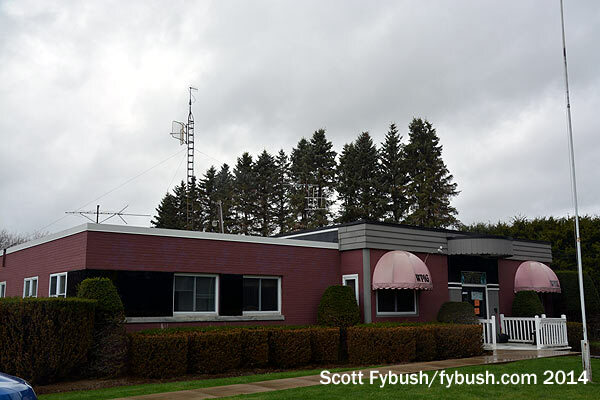 Bonaventure NY”), but we did pay a call just down 417 at the oldest station in town, WHDL (1450) and its FM sister, WPIG (95.7). 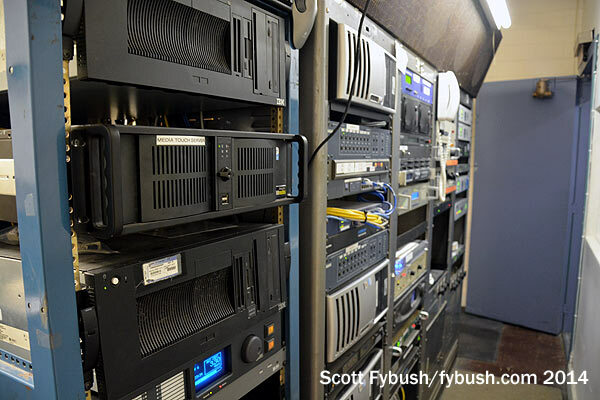 The tech core is right at the heart of the building, straight back from the lobby as you walk in, with the audio networking, STL, processing, IT and other gear in a long row of racks leading back to the Harris MW-1 in back and the newer BE kilowatt rig that now powers WHDL. The studio core sits next to the tech room, and here you can see those spiffy (and remarkably compact!) Logitek consoles in action. 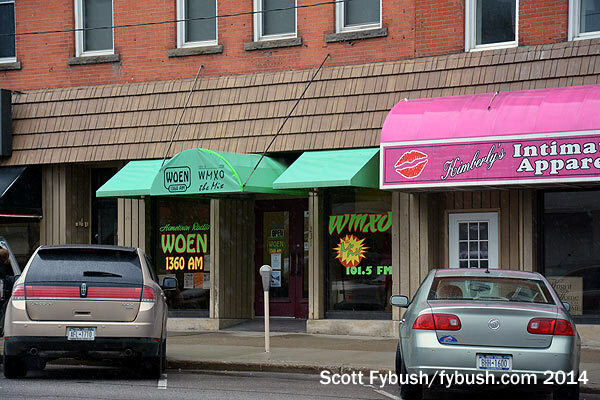 At left above is the studio for WHDL, which runs mostly satellite sports these days as an ESPN affiliate (the calls now stand for “The Huddle”); at right is former afternoon jock Brad Majors on WPIG, “Sizzlin’ Country,” which has long been the dominant FM voice in the market from its class B facility up in the hills south of town along Route 16. “South of town” is where we’re headed next on this gray April day – join us next week for a look at some northern Pennsylvania signals that pick up where Olean leaves off! Thanks to Colonial’s Jeff Andrulonis and the staff of WHDL/WPIG for the tours! And don’t miss a big batch of Southern Tier IDs next Wednesday, over at our sister site, TopHour.com!